Are you in search for glamorous hairstyles for your little girls? If yes, you are the right place. Try your best to give your girls stylish looks when they are on holidays. This gives them a fashion taste from a tender age. Always choose hairstyles that match with the length of your children’s hair, failure in which you risk damaging their hair. Always have a glimpse of your little girls taste before choosing a hairstyle for them. Consult them or your stylist before making a decision on the hairstyles to adopt. Go through the list below and identify hairstyles that suit your children. This hairstyle suits any child, provided her hair attains the required length. Funky sleek hairstyle with bangs is characterized by both a layered and black look on the head. Fringe hair should be rested on the forehead. Your stylist should trim your little girl’s fringe hair to attain a uniform look. Ensure your fringe hair conjoins with hair on both the right and left side of the head. Similarly, your mid head should conjoin with hair on both sides of the head. 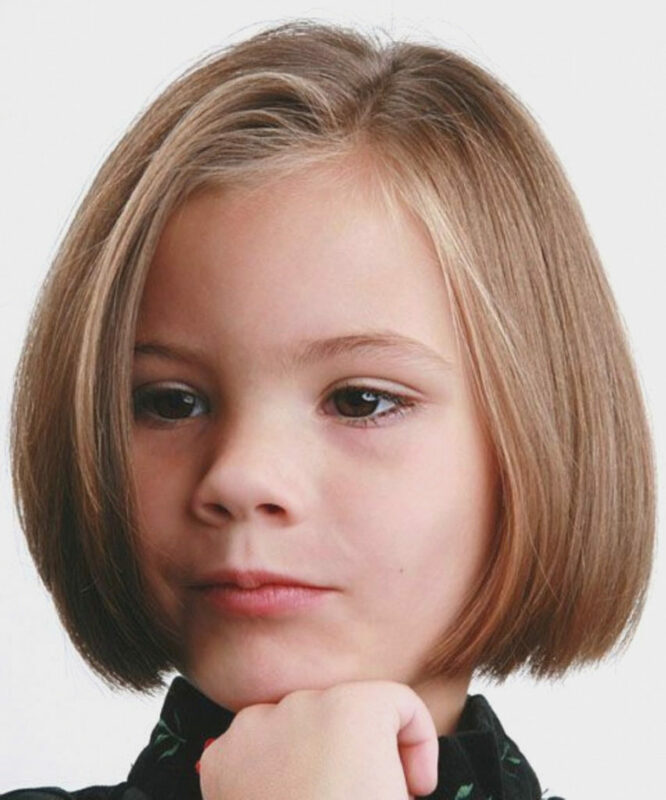 The layered look gives your child an easy time maintaining this glamorous hairstyle. Your little girls will outshine anyone around them if you choose this hairstyle. It is characterized by a brown look throughout the head. Here, your stylist can use natural hair or weave when designing this marvelous hairstyle. Afterwards, sleek bob princess hairstyle should adopt a layered look throughout the head. The layered look makes it easy to attain a curvy look on the head. Comb mid head hair on both the right and left side of the head. Here, you are free to choose the size of a curvy look for your little girl. Here, attention lies on both sides of the head. As the name suggests, front view hair should rest on both the right and left side of the head. There should be a line on your mid head to determine the direction a section of your hair should rest facing. A large fraction of front view hair should lie on the left side of the head. Traces of different colors should be visible on the head. These colors range from red, blue and purple. Finally, form a curly-wavy look on both sides of the head. Simple wavy hairstyle with curls is characterized by a blonde look throughout the head. Here, your child’s fringe and forehead hair should conjoin with both the right and left sideways hair. That’s not all; a layered look should be adopted throughout the head. The layered look makes it easy to form waves on both sides of the head. In addition to these, it enhances the looks of this hairstyle. 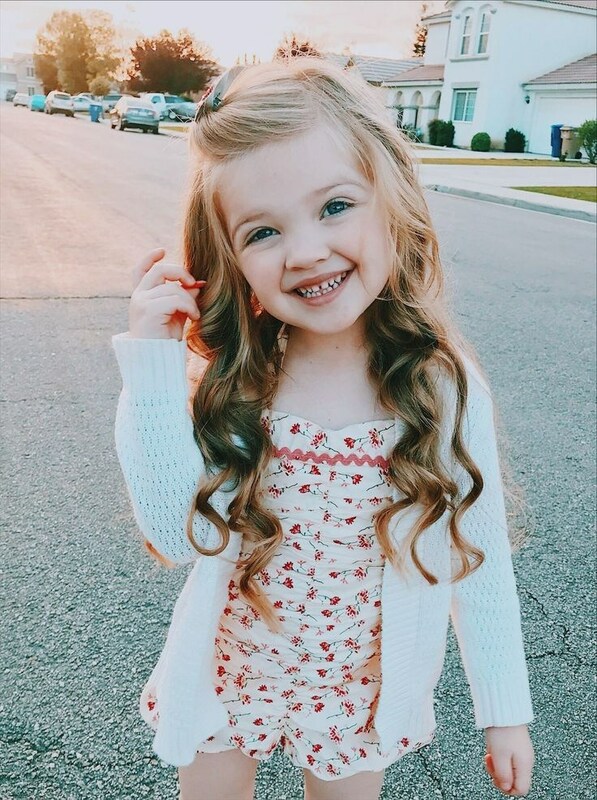 Simple wavy hairstyle with curls is recommended for children as it easy to maintain and perfectly blends with any outfit they choose. Start off by drawing a line on the mid head of your daughter’s hair. Mid part straight hairstyle suits parents who desire both a temporary and a permanent hairstyle. This marvelous hairstyle focuses on attaining both a blonde and layered look throughout the head. As the name suggests, a line should be drawn at some point on the mid head. This line determines if the front view hair will rest on the right or left side of the head. Additionally, form a curvy look on your entire hair. Your little girl will look amazing on this hairstyle. Try it out. 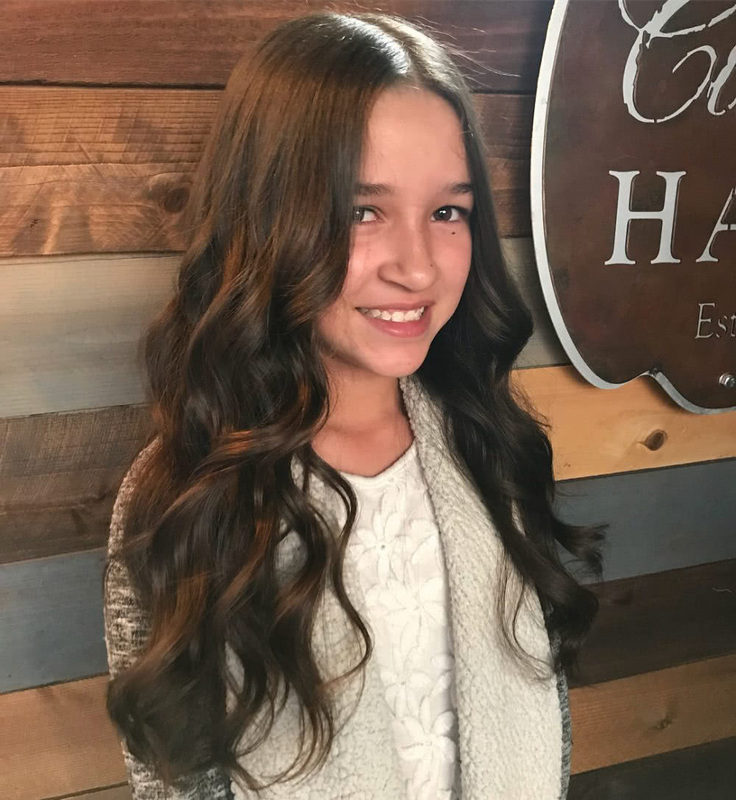 Do you desire a curly look throughout your daughter’s head? If yes, check out vintage curls hairstyle. This hairstyle is characterized by both a blonde and curly look throughout the head. Vintage curls hairstyle has been around for a long period. Parents choose this hairstyle for their children as it is easy to attain and maintain. A layered look is recommended if you desire to form curls on your child’s hair within a short period. Above all; parents and stylist have the freedom of choosing the size of curls to form on the head. Here, you have the freedom of choosing the dull color to use when designing this hairstyle on your child’s head. It can be either brown, blonde, highlight or black. Textured hairstyle perfectly blends with any outfit your child wears. Front view hair should be sleeked straight on either the right or left side of the head, depending on its position. Hair on the back of the head should be combed straight towards its natural growing direction. Form a curved look on both sides of the head and a section of hair on the back of the head. Natural hair or weave can be used to design this hairstyle for your little girl. Long bohamian hairstyle emphasizes that sideways hair stretches past the shoulders. Enhance the looks of this hairstyle through blow dry and adopting a layered look. Draw a line on the mid head to divide fringe and mid head hair into two sections. One section should rest on the right side of the head and the other on the left side. The layered look makes it easy to adopt a curly-wavy look on both sides of the head and a section of hair on the back of the head. This is a common hairstyle among children and adult. Draw a line on your child’s head. This line determines if the front view hair will rest on the right or left side of the head. Above all, you should adopt a black look on your child’s head. Form a curvy look on both sides of the head. Choose this hairstyle for your little girl as it perfectly blends with any outfit. It also makes it easy to adopt another hairstyle within a short period. Trim your child’s hair so that it remains within the neck region. Do you desire to give your little girl a latest hairstyle? If yes, check out urban fringe haircut. Adopt a layered look on the head before commencing the designing process. Rest your child’s fringe hair on her forehead and should conjoin with hair on both sides of the head. Go ahead and trim fringe hair to attain a uniform look. Conjoin mid head hair with hair on both sides of the head before combing it straight behind both sides of the head. Don’t forget the layered look throughout the head. 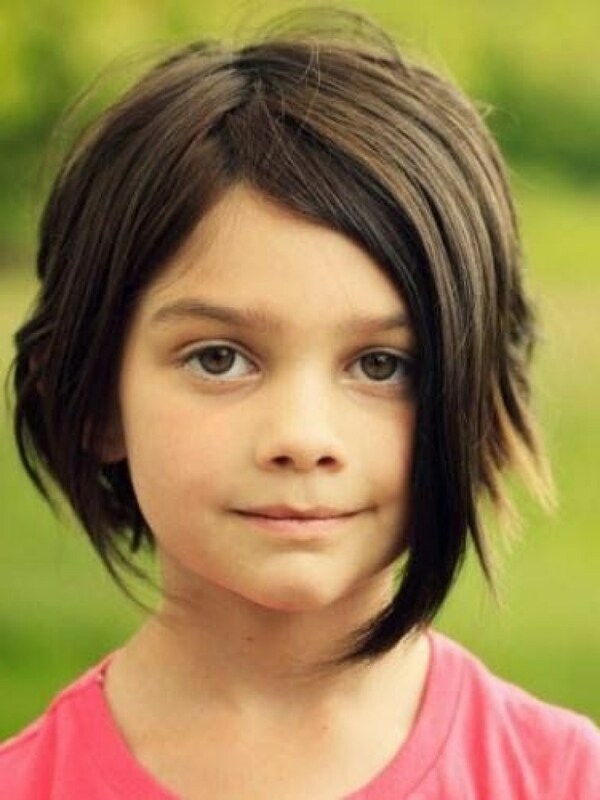 Cute girl hairstyle focuses on showcasing your child’s hair. Divide your child’s hair into different sections. Choose this hairstyle as it gives you a lot of designing options. Conjoin hair on each section and plait it. As the name suggests, this is a temporary hairstyle. It suits parents who desire to give their children a glamorous look while looking for a long term hairstyle. Enhance the looks and texture of your child’s hair through blow dry. Consider this glamorous hairstyle. Start off by adopting both a layered and blonde look throughout the head. Apply blow dry on your little girl’s hair to enhance both its looks and texture. Draw a line at some point on the mid head. This line divides both the fringe and mid head hair into two sections. One section should be combed straight on the left side of the head and the other one on the right side of the head. Go on and form a curvy look throughout your child’s head. 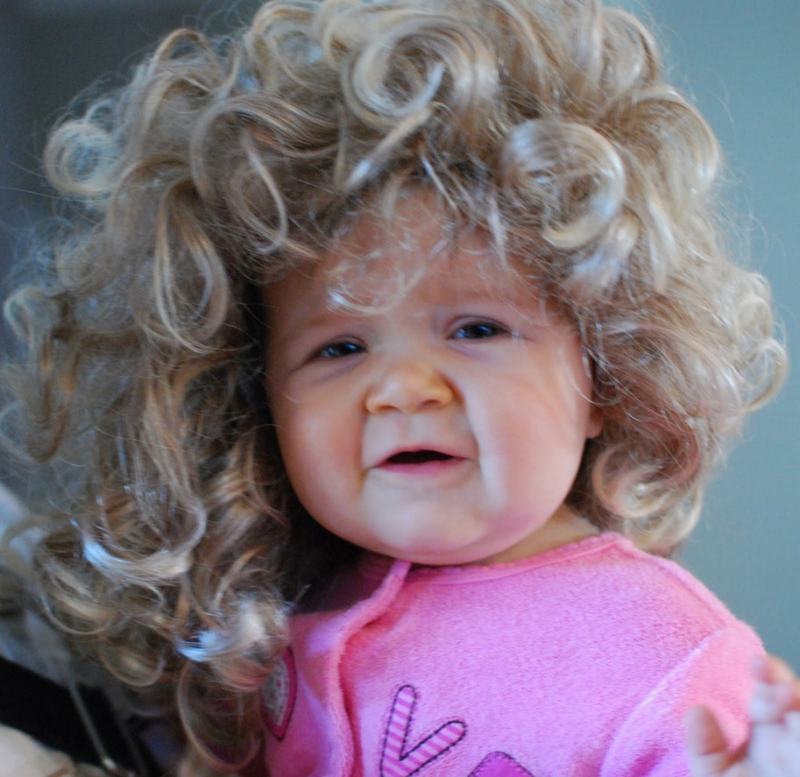 Finally, your daughter will have an easy time maintaining this hairstyle. Choose this hairstyle for your daughter if she has at least medium length hair. Separate the right sideways hair from the rest of front view hair through a line. Comb your child’s right sideways hair straight toward its natural growing direction. Sleek the remaining front view hair on the left side of the head. Trim hair on both sides of the head so that it reduces in size going towards the back of the head. This is the simplest way of forming a rounded back on the back of the head. Your little girl should have at least coarse hair to be eligible for this hairstyle. Short braids with colored beads hairstyle focuses on giving you a unique look. Here, you are free to choose the color of beads to attach with your child’s hair. Plait your child’s hair throughout the head before attaching beads. Use rubber bands to conjoin your child’s hair with beads. Feel free to determine the number of beads to use when designing this hairstyle. In addition to these, this glamorous hairstyle perfectly blends with any outfit your little girl wears. Straight faux haircut deserves a spot on this list. Enhance the looks of your child’s hair through blow dry and adopting a layered look. The layered look makes it easy to maintain this hairstyle. It also helps adopt a wavy look within a short period. Comb your child’s fringe hair on your forehead. Conjoin it on both sides of the head before trimming its edges to attain a uniform look. Conjoin mid head hair with hair on both sides of the head before combing it straight past your shoulders. Finally, form a wavy look on both sides of the head. Asymmetric bob hairstyle deserves a spot on this list. 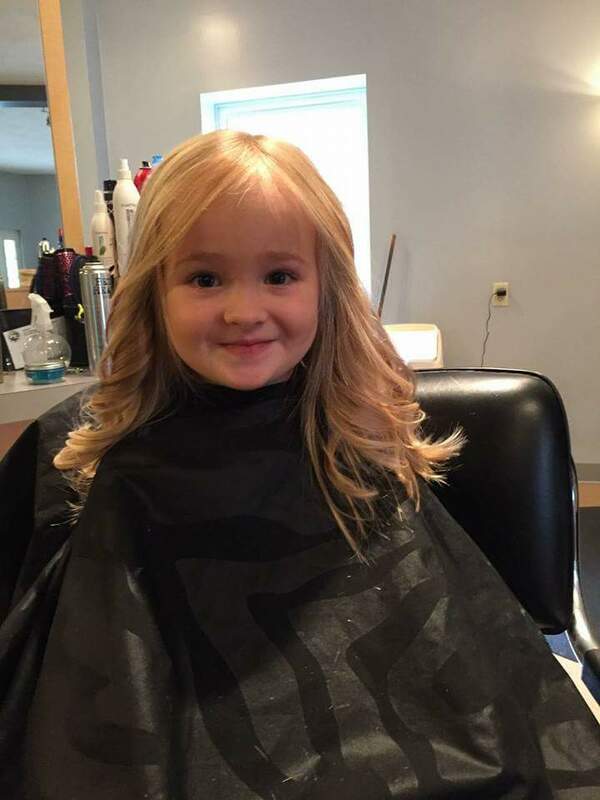 This marvelous little girls’ haircut is characterized by both a layered and blonde look throughout the head. Consequently, a line should be drawn at some point on the mid head. This line divides your child’s front view hair straight either towards the right or left side of the head. The layered look enhances the looks of this marvelous hairstyle. It also makes it easy to form a curvy look within a short period. This hairstyle also gives your daughter’s hair enough breathing space. Here, attention lies on both sides of the head. 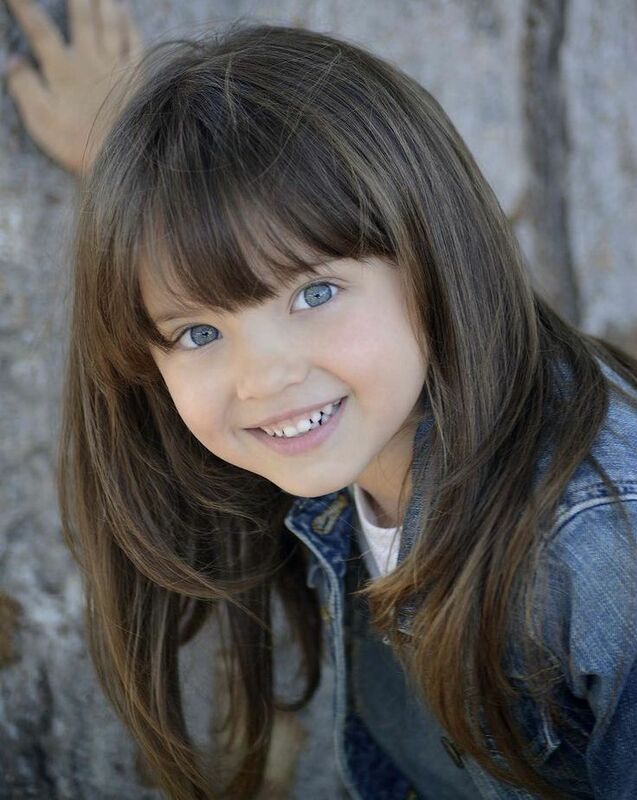 Wispy ends bangs hairstyle focuses on giving your child a black look throughout the head. Comb your child’s left sideways hair, right sideways hair and hair on the back of the head straight towards its natural growing direction. Proceed and conjoin both your fringe and mid head hair before combing it straight on either the right or left side of the head. Carry on and form both a layered and curvy look throughout the head. You are free to choose the size of curvy look to adopt on your child’s head. You can use natural hair or weave when designing lovely layers hairstyle for your little girl. Here, front view hair should rest straight on either the right or left side of the head. Draw a line to determine the direction a section of front view hair should rest facing. Lovely layers hairstyle gives your loved one an opportunity to showcase her hair and pretty face. Lovely layers hairstyle is also characterized by curly look on both sides of the head. Choose the size of curls to form on both sides of the head and a section of hair on the back of the head. Summer straight hairstyle is the simplest and easy to attain hairstyle on this list. Start off by blow drying your child’s head. In addition to this, her hair should attain a black look throughout the head. Adopt a layered look before combing your right sideways hair, left sideways hair and hair on the back of the head straight towards their natural growing direction. Conjoin fringe and mid head hair before sleeking it straight towards either the right or left side of the head. Trim the edges of your hair to attain a uniform look. Your daughter will look like a princess if you choose this hairstyle. As the name suggests, you should place a crown on your child’s head. Furthermore, front view hair should rest straight on either the right or left side of the head. That’s not all; give the entire hair a layered look. Go on and form a curvy look on hair on both sides of the head. Comb hair on the back of the head straight. Lastly, your child will have an easy time maintaining this hairstyle. Here, this hairstyle is attributed by a redhead look throughout the head. 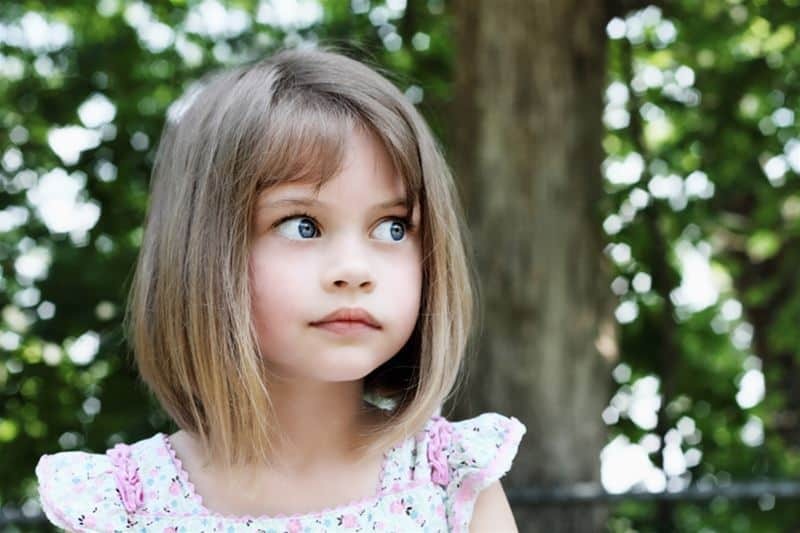 Consequently, brown color can also be used when designing this hairstyle for your child. A large fraction of front view hair should rest on the right side of the head. That is your fringe hair, mid head and your right sideways hair. Form a layered look throughout the head before sleeking your hair straight towards its respective direction. Finally, form a curly-wavy look on both sides of the head. Choose an experienced stylist if you desire your child to look good on this hairstyle. Your stylist should comb your child’s right sideways hair, left sideways hair and hair on the back of the head straight towards their respective direction. Afterwards, sideways hair and a section of hair on the back of the head should attain a curly-wavy look. Conjoin your fringe and mid head hair before forming a top knot on the mid head. Top knot silky hairstyle gives you the freedom of choosing the size of curls to form on your child’s head. Comb your front view hair straight in either the right or left side of the head. Similarly, hair on the back of the head should be combed straight. 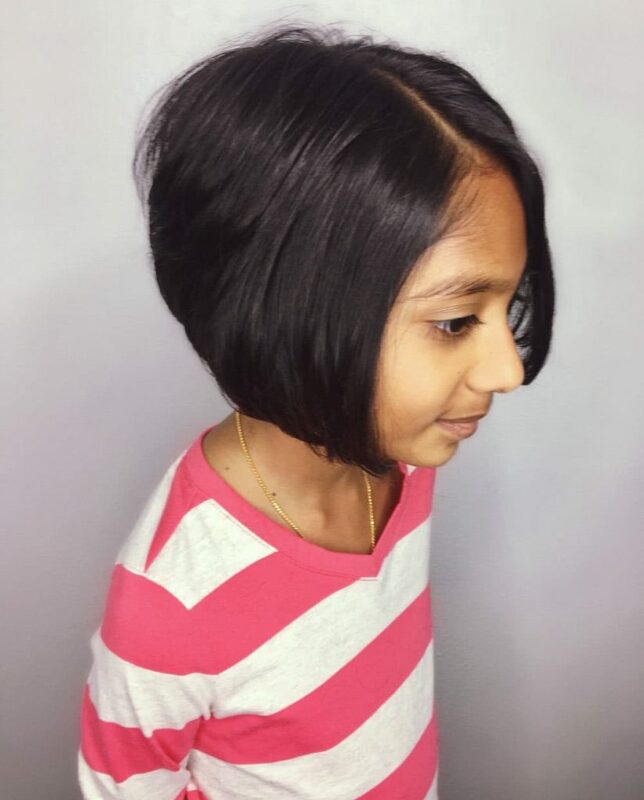 Enhance the looks and texture of this little girl’s haircuts through blow dry. Feel free to also adopt a layered look on your head. Conjoin a section of hair on the right side of the head and plait it. Afterwards, sleek it straight past your shoulders. Sideways fishtail hairstyle gives you an opportunity to showcase your long hair. Your little princess will definitely stand out from other children if you consider this hairstyle. Bob with bangs focuses on showcasing your child’s fringe hair. Trim the fringe hair to attain a uniform look. That’s not all; ensure your daughter’s fringe hair conjoins with hair on both sides of the head. Carry on and form a curvy look on both sides of the head. Feel free to attach a headband on your child’s head. A large fraction of your child’s front view hair should rest on the right side of the head. Form a curly-look on both sides of the head and on a section of hair on the back of the head. The layered look makes it easy to form curls throughout the head. It also makes it easy to differentiate designer lob hairstyle from other similar hairstyles. Choose this hairstyle for your child as it is easy to maintain. It also brings out a unique look.